Several years ago, I ate at the Hard Rock Cafe in Times Square with my pal, Becky. That's right, people… I said years. When it comes to food, I always remember the good stuff. While there, I chowed down on what I assumed would be a basic chicken salad. Instead, I received a sandwich that has stayed in my memory for so long, I now have to recreate it. Luckily, I was smart enough to take a picture of the menu description, whew! So I had a basic idea of what was needed for this beauty. The menu description stated, "Poached chicken with celery and green onions, in a light citrus mayo with dijon and dill. Served on a toasted hoagie with spring mix, cranberries, and goat cheese". I started with the citrus mayo. Easy peasy, people. Naturally, I forgot one ingredient in the picture above. Pretend there's salt in there, ok? 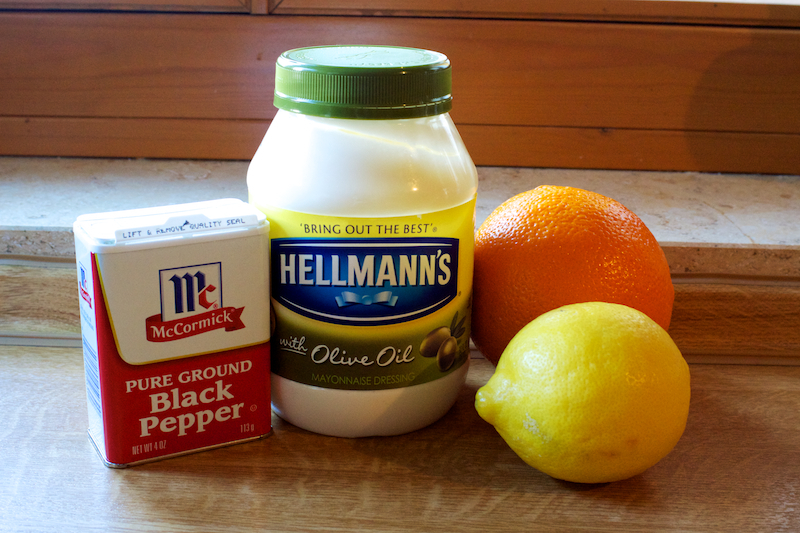 To make the citrus mayo, mix together ¾ cup mayonnaise with 2 teaspoons fresh lemon juice, 3 tablespoons fresh orange juice, ½ teaspoon orange zest, and ¼ teaspoon each salt and pepper. You could throw in a little lemon zest too, if you wanted. I just like the orange flavor a bit more. 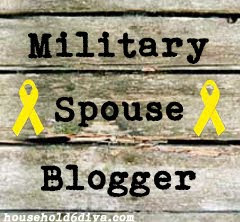 Sometimes I zest a little of both. And that's it! See how simple that was? Now on to the chicken itself. Start with 3 cups of cooked, diced chicken breast. 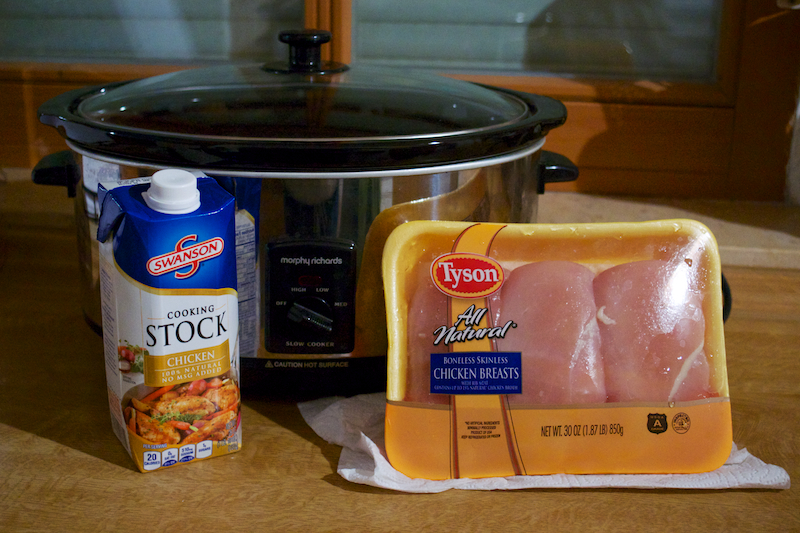 I poached my chicken in the crockpot, because it is way too hot to turn on my oven right now. You can cook yours any way you like, but I love how moist and juicy poached chicken is. At this point, chill the salad until you're ready to serve it. When you're ready to make sandwiches, we'll add a few more things. I really want a sandwich now. Seriously might need to raid my fridge. Slice your bread roll in half. I prefer a crustier bread roll, definitely not plain sandwich bread. 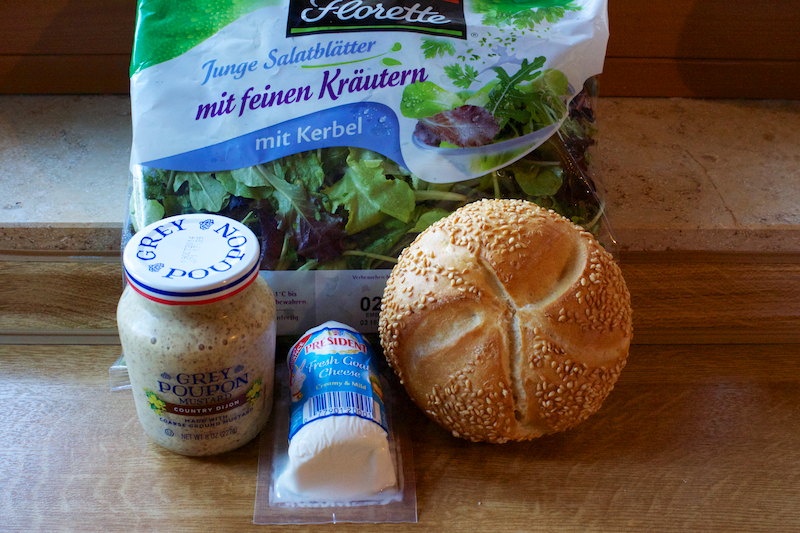 Look for kaiser or onion rolls, or maybe ciabatta bread. Yum. Add a little mayo to the top piece of bread. You can also add dijon to the bottom piece, but I found this to be overwhelming. If you want my advice, don't do it. But if you really want to… well, it's your sandwich. 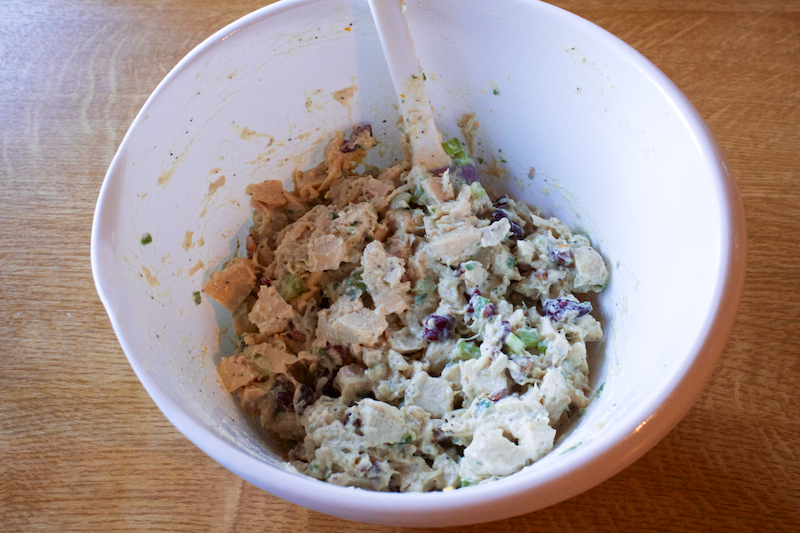 Pile some of the chicken salad on the bottom half of your bread (this should make 4 sandwiches). 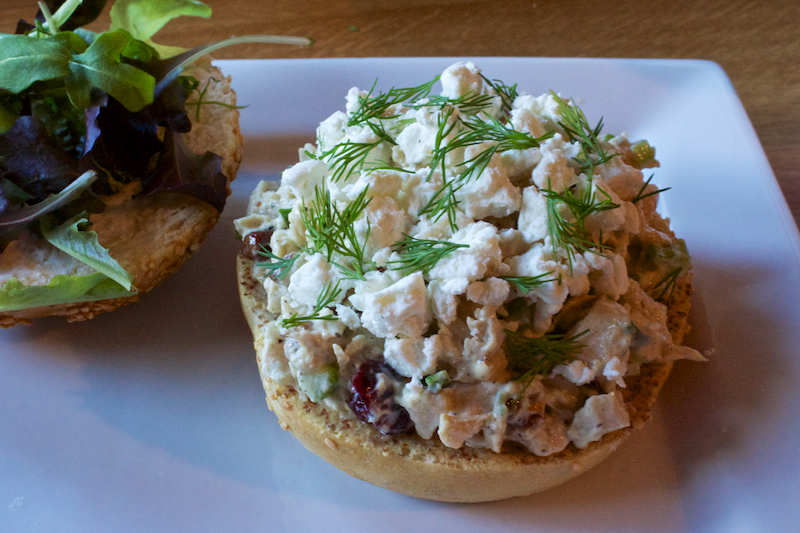 Sprinkle about 1 ounce of crumbled goat cheese on top, and then about ½ teaspoon of fresh dill. Top with a bit of spring mix and the other side of the bun, and viola! 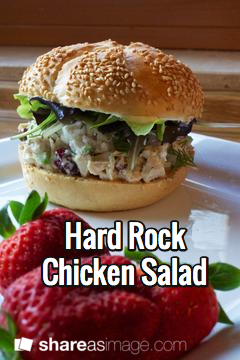 Hard Rock Chicken Salad Sandwich. Basic, simple, tasty, and perfect for that summer heat. Serve with some fresh fruit or a green salad. Later this week, I'll show you an easy recipe for creamy lemon salad dressing… it would go great with on a side salad for this sandwich! What are your favorite recipes to beat the heat? Comment below with your favorites, or send me your pins. I love testing out new things. 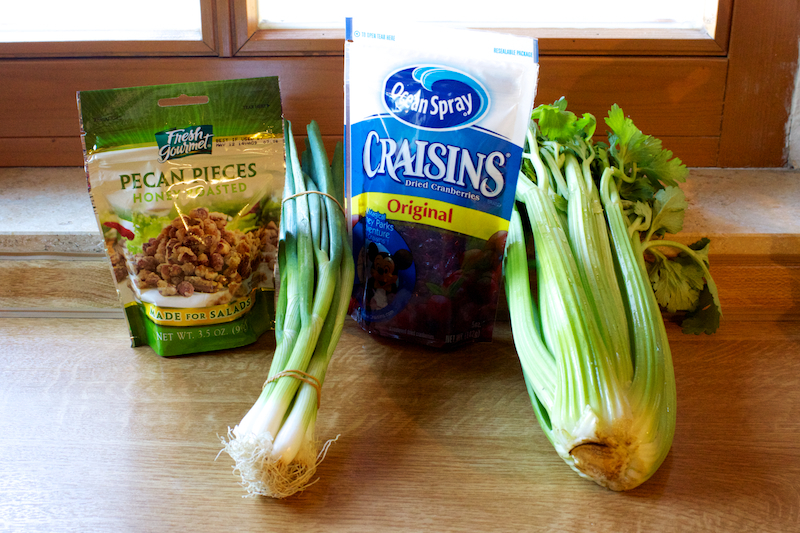 Combine the poached chicken with the citrus mayo, celery, green onion, cranberries, and pecans. Stir until well combined. Chill 1 hour before serving. To serve, slice the bread rolls in half. Spread one side with a thin layer of additional mayo, or Dijon if desired. 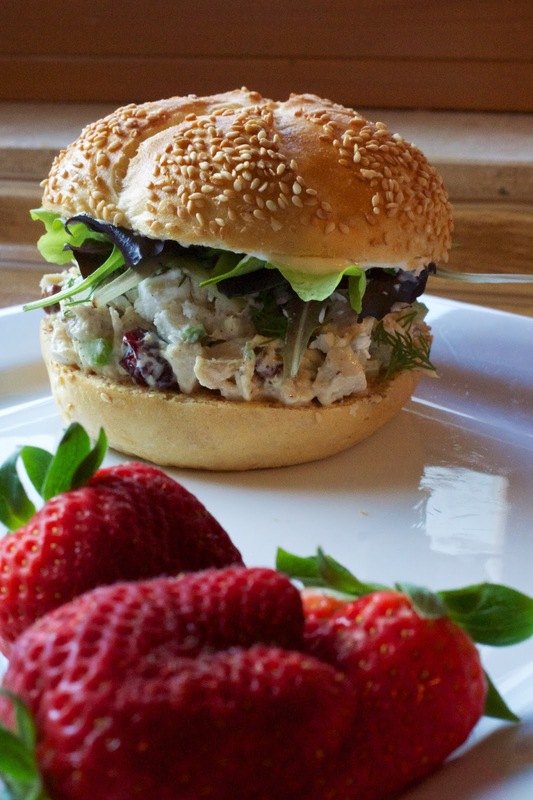 Mound chicken salad on the bottom half of the bread. Top the salad with 1 oz. crumbled goat cheese, ½ teaspoon of fresh dill, and spring mix. Add top piece of bread. Serve with a green salad. For the citrus mayo: Combine ¾ cup mayonnaise with 2 teaspoons fresh lemon juice, 3 tablespoons fresh-squeezed orange juice, ½ teaspoon orange zest, and ¼ teaspoon each salt and pepper.